After World War II, three teenage boy rocket experimenters are recruited by one boy's uncle, Dr. Cargraves, a renowned physicist who had worked on the Manhattan Project, to refit a conventionally powered surplus "mail rocket". It is to be converted to run on a thorium nuclear pile which boils zinc as a propellant. They use a cleared area in a military weapons test range in the desert for their work, despite prying and sabotage attempts by unknown agents. Upon completion of the modifications, they stock the rocket, which they name the Galileo, and take off for the Moon, taking approximately three days to arrive. After establishing a semi-permanent structure based on a Quonset hut, they claim the Moon on behalf of the United Nations. As they set up a radio to communicate with the Earth they pick up a local transmission, the sender of which promises to meet them. Instead, their ship is bombed. However, they are able to hole up undetected in their hut and succeed in ambushing the other ship when it lands, capturing the pilot. They discover that there is a Nazi base on the Moon. They bomb it from their captured ship and land. One survivor is found, revived, and questioned. The boys also find evidence of an ancient lunar civilization, and postulate that the craters of the Moon were formed not by impacts from space, but by nuclear bombs that destroyed the alien race. When the base's Nazi leader shoots the pilot in order to silence him, Cargraves convenes a trial and finds him guilty of murder. Cargraves prepares to execute the prisoner by ejecting him into vacuum, mostly as a bluff for information on how to fly the base's spaceship. The Nazi capitulates in the airlock and teaches them how to fly the ship back to Earth. The boys radio the location of the hidden Nazi base on Earth to the authorities, leading to its destruction; they return as heroes. The 1950 movie Destination Moon was loosely based on Rocket Ship Galileo, and Heinlein was one of three co-authors of the script. The film's plot also resembles that of "The Man Who Sold the Moon", which Heinlein wrote in 1949 but did not publish until 1951. 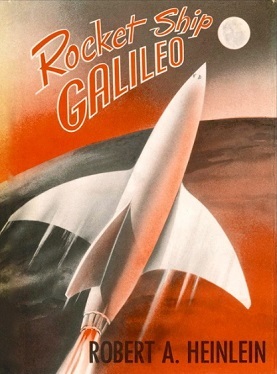 Surveying Heinlein's juvenile novels, Jack Williamson noted that while Rocket Ship Galileo remains "readable, with Heinlein's familiar themes already emerging," it was a "sometimes fumbling experiment. ... The plot is often trite, and the characters are generally thin stereotypes." Robert Wilfred Franson said that "Heinlein wants there always to be young people of the right mind and character to seize such opportunities. His novels went a long way toward educating such a class of people, and still are doing so." Andrew Baker wrote: "'Rocket Ship Galileo' shares with numerous works composed before the advent of the actual Space Program a gross underestimation of the huge costs and investment of resources needed for any jaunt outside Earth's gravitational field. (...) The idea of private people (boys in this case) being able to just take off to the Moon on their own can ultimately be traced - like so many Science Fiction themes - to the fertile mind of H.G. Wells and to the two English gentlemen quietly taking off to the Moon in The First Men in the Moon. (...) The politics of 'Galileo' are still those of the World War II anti-Nazi Alliance, not of the emerging Cold War. Had it been written a few years later, the villains would have likely been Russian Communists". ^ Robert A. Heinlein, Expanded Universe, foreword to "Free Men", p. 207 of Ace paperback edition. ^ Jack Williamson, "Youth Against Space," Algol 17, 1977, p.10. ^ "Review by Robert Wilfred Franson". Retrieved May 25, 2012. ^ Andrew D. Baker, "Imagined and Real Spaceflight" in Diana Wheatfield (ed.) "Essays on the Development of 20th Century Science Fiction". Bleiler, Everett (1948). The Checklist of Fantastic Literature. Chicago: Shasta Publishers. p. 146. This page was last edited on 16 January 2019, at 15:09 (UTC).